The documentary Citizenfour, which debuted to a limited release on Friday, offers the closest look yet at Edward Snowden, the whistleblower who exposed the National Security Agency spying scandal. In the film, Snowden and the journalists he works with go to great lengths to shield their correspondence from unwanted eyes. Though Laura Poitras’ film explores a very extreme circumstance — a massive leak of top-secret information to the press — it’s as good a reminder as any that we live in a time of widespread government surveillance, and you can’t be sure who’s intruding on or monitoring your Internet activity and communications. You might want more privacy online for any number of reasons — you could be a journalist reporting on a sensitive topic, like Poitras and Glenn Greenwald, or you might just want more peace of mind in light of the NSA revelations. To better protect yourself, here are 11 tools (presented in no particular order) to help you encrypt data, block intrusive trackers or remain altogether anonymous on the web. Note that this is by no means an exhaustive list of what’s out there, and no security measure is 100% effective. All of the tools listed here are free. Tor is a free software program that allows people to use web connections anonymously. Widely considered to be one of the best privacy tools on the web, Tor can be downloaded as a software package, and there’s a Tor-enabled browser available. It’s difficult to track information that passes through Tor — so much so that Russian President Vladimir Putin has put up a $110,000 reward for anyone who can crack its secrets. The Guardian Project creates open-source apps to help people communicate privately. All of the group’s software is downloadable for free for Android smartphones. For secure web browsing, there’s a privacy-friendly browser called Orweb that works with a Tor-enabled proxy called Orbot for mobile. There’s also a private messaging service called ChatSecure, an app for private phone calls and a pixel-destroying camera tool to blur faces in photos. This project is almost worth a list all its own. DuckDuckGo is a search engine that doesn’t track or share any of your information. If you’re looking for better privacy, use this over Google. When you’re browsing the web, you’ll notice that URLs typically have the “http://” prefix, if not the more secure version: “https://” (HTTP Secure). The HTTPS Everywhere browser plugin works with Chrome, Firefox and Opera, and it attempts to automatically switch any HTTP web address over to HTTPS, which encrypts communication between you and the server to protect against eavesdropping or impostors. Ghostery allows you to keep tabs on companies that track your visits to websites. With this browser extension, you can block companies from collecting your browsing data. Ghostery has a popup option that displays a message each time you visit a site with a list of who’s tracking you. Privacy Badger is a browser extension that can block third-party advertisers, but it has a moral compass. If Privacy Badger suspects a tracker is overstepping its bounds by tracking what you’re doing without your permission, the extension stops the advertiser in its tracks. It’s all based on the principle of user consent: If the advertiser breaks the rules, Privacy Badger cuts the cord. You may have heard of PGP (Pretty Good Privacy), an encryption program developed in the early ’90s to make email conversations more secure. It’s a bit outdated, though. The better option is GPG. The GNU Privacy Guard system allows you to encrypt and sign your data. Each party has a pair of “keys,” one public and one private. The sender, in this case, sends the email to the receiver’s public key, but this encrypted message can only be deciphered if the receiver enters his or her private key (that is known only to them) upon reception of the communication. Cryptocat is an encrypted chatting service that can be added as a browser extension or downloaded as an app for Mac systems. It is one of the more popular encryption tools available, often used by journalists and human rights advocates. Put simply, only the sender and receiver can see the actual content of the message. When messages are traveling through Cryptocat, they’re unreadable. As a bonus, the application supports file-sharing. Mashable previously described Wickr as “Snapchat for grownups,” and that’s a good way to put it. Wickr sends photos, video and file attachments that will eventually be deleted, but unlike Snapchat, Wickr encrypts messages. Not even Wickr itself is supposed to know what’s in the messages you send. What you send can last anywhere from a few seconds to several days. For phone calls on iPhones, there’s an app called Signal, and it’s probably the best iOS app available for phone call encryption. Open Whisper Systems, the developer behind Signal, has an Android equivalent called RedPhone that provides end-to-end encryption. Eventually, RedPhone will be rolled into Signal to unify the platform, but the apps are already compatible with each other. Snowden himself has praised Open Whisper Systems for their easy-to-use encryption apps. For those of you who are very serious about ramping up your privacy online, the Electronic Frontier Foundation, a nonprofit group that advocates for civil rights as they pertain to modern technology, has published an extensive index of security tips and explainers for all sorts of Internet users, be they beginners or experts. It’s a good place to tread a bit deeper into protecting yourself from unwanted surveillance. 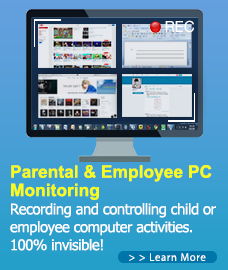 If you would like to record and control all your children or employees’ activities on working PC, SurveilStar Monitoring would be your best choice. A 30-day free trial version of this professional computer monitoring and tracking software is available. Feel free to download and try to check what your employees and children have done on PC. This entry was posted in Computer Monitoring, Data Security, SurveilStar Employee Monitoring and tagged APPS, APPS AND SOFTWARE, Best Computer Monitoring Software, browsing monitoring, Computer Monitoring, data monitoring, MOBILE, protect your online activity, TECH. Bookmark the permalink.